As previously article (Security for Hadoop - Data Encryption) mentioned, data encryption is still not officially support . 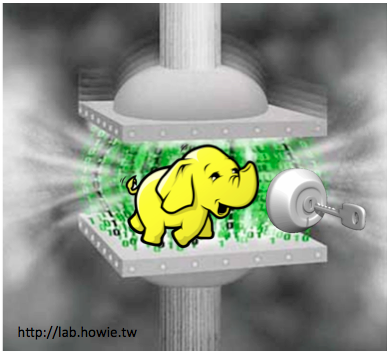 Today I want to show you an interesting project call HadoopCryptoCompressor , which is a simple "compressor" for hadoop (really don't compress anythig) but enable you to encrypt your data with public key "AES/CBC/PKCS5Padding". This project has also propose to Hadoop , The JIRA id is HADOOP-7857. Unfortunately, the original version started by geisbruch is not work for me. so I decided try to fix it . And I also merge another branch (fork by ubiquitousthey ). Here is my fork& Patch version - howie/HadoopCryptoCompressor , and I will show you how to use this plugin. Ps. this may not work in some full distributed environment. After install HadoopCryptoCompressor-0.0.6-SNAPSHOT.jar, Let's look into some scenario. Notice that Hadoop Compression will trigger by detecting File name Extension , only if the encrypt file name is *.crypto. In this scenario we try to load an encrypt file into hive ,and can select by hive. Run hive , go into hive shell mode.